The law of Israel treats the widow as a privileged person, and seeks to indemnify her in some degree for the loss of her natural protector. Thus the movable property of a widow can not be attached for debt (Deut. xxiv. 17), whether she be rich or poor, though the text speaks only of her garment (see Execution). To meet the monition of Isaiah (i. 17), "Judge the fatherless, plead for the widow," it became the rule, in arranging the order of cases in a court, to take up the complaints of widows next after those of the fatherless (see Procedure in Civil Causes). The duty of judges to do full justice to the complaining widow is emphasized by the assertion that God Himself "doth execute the judgment of the fatherless and widow" (Deut. x. 18), and that "a father of the fatherless, and a judge of the widows, is God in his holy habitation" (Ps. lxviii. 6). Widowhood "after marriage" gives to a daughter complete independence of her father; she becomes, in legal language, "an orphan during the father's lifetime." This principle is thus broadly laid down (Ket. iv. 2): "After he has given her in marriage the father has no power over her," though it is different where the husband dies after betrothal, but before marriage. Under the sacerdotal law (Lev. xxi. 14) a widowis not a suitable wife for the high priest, but she may marry an ordinary priest ("kohen hedyoṭ"). Yet, according to the Rabbis, where the latter has married a widow, and is thereafter appointed high priest, he may retain her as his wife (Yeb. 77a). Ezekiel (xliv. 22), in his scheme of a hierarchy, forbade to the ordinary priest marriage with a widow, unless her first husband had been a priest; but his scheme was never accepted as law. In marrying again, a widow naturally is not favored as highly as a maiden. The smallest jointure for the latter is 200 zuzim; for the former, only a mina, or 100 zuzim (Ket. i. 2). Marriage with a maiden is generally celebrated on Wednesday; with a widow, on Thursday (Ket. i. 1). The rights of the widow in the husband's estate have, in the main, been set forth under Ketubah, and are secured by the contract. The question of priority in payment between the widow's dues and the bond creditors of the husband, or between several widows of a polygamous husband, has been treated under Priority. In the opinion of R. Akiba, prevailing over that of R. Ṭarfon, there is no "marshaling of assets" from outstanding deposits or demands in favor of the widow or of creditors; but the heirs are allowed to collect them, or to take possession (Ket. ix. 2, 3). The reason given is that no one can collect a demand against the decedent's estate without an oath (if such is required by the heirs) that he has not received it before, either in whole or in part. Notwithstanding the difference between the customs of Jerusalem and Galilee on the one hand, and of Judea on the other, mentioned in Ket. iv. 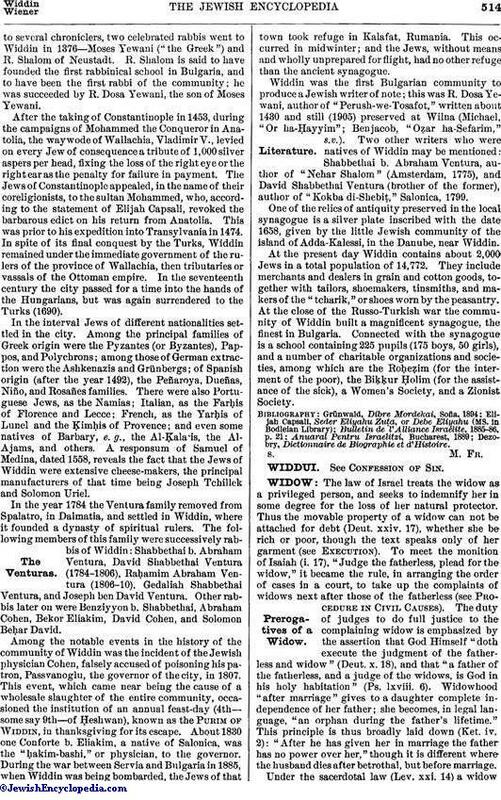 12, the rule was recognized at an early day that the widow may dwell in her late husband's house, and receive her support from his estate, as long as she remains his widow and until she judicially demands payment of her dowry and jointure, or accepts such payment (see Bertinoro ad loc.). 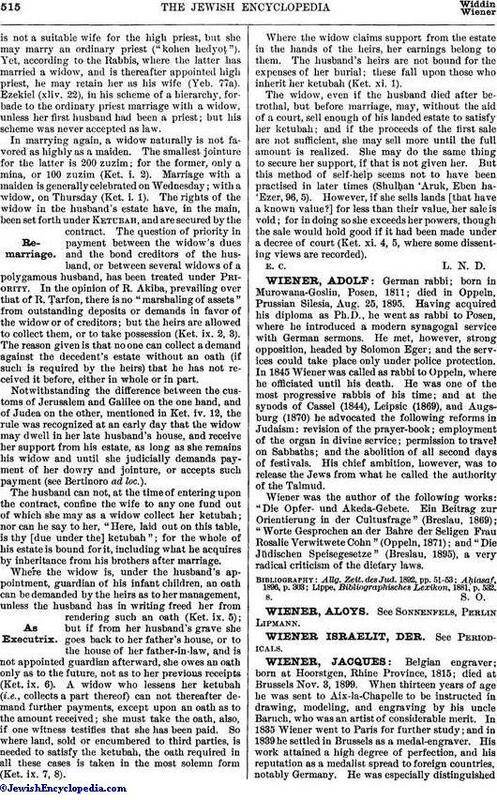 The husband can not, at the time of entering upon the contract, confine the wife to any one fund out of which she may as a widow collect her ketubah; nor can he say to her, "Here, laid out on this table, is thy [due under the] ketubah"; for the whole of his estate is bound for it, including what he acquires by inheritance from his brothers after marriage. Where the widow is, under the husband's appointment, guardian of his infant children, an oath can be demanded by the heirs as to her management, unless the husband has in writing freed her from rendering such an oath (Ket. ix. 5); but if from her husband's grave she goes back to her father's house, or to the house of her father-in-law, and is not appointed guardian afterward, she owes an oath only as to the future, not as to her previous receipts (Ket. ix. 6). A widow who lessens her ketubah (i.e., collects a part thereof) can not thereafter demand further payments, except upon an oath as to the amount received; she must take the oath, also, if one witness testifies that she has been paid. So where land, sold or encumbered to third parties, is needed to satisfy the ketubah, the oath required in all these cases is taken in the most solemn form (Ket. ix. 7, 8). Where the widow claims support from the estate in the hands of the heirs, her earnings belong to them. The husband's heirs are not bound for the expenses of her burial; these fall upon those who inherit her ketubah (Ket. xi. 1). The widow, even if the husband died after betrothal, but before marriage, may, without the aid of a court, sell enough of his landed estate to satisfy her ketubah; and if the proceeds of the first sale are not sufficient, she may sell more until the full amount is realized. She may do the same thing to secure her support, if that is not given her. But this method of self-help seems not to have been practised in later times (Shulḥan 'Aruk, Eben ha-'Ezer, 96, 5). However, if she sells lands [that have a known value?] for less than their value, her sale is void; for in doing so she exceeds her powers, though the sale would hold good if it had been made under a decree of court (Ket. xi. 4, 5, where some dissenting views are recorded). E. C. L. N. D.